Calls are ramping up in the US this week for Donald Trump to drop his support for the Saudi war on Yemen. But what about in the UK? This August saw Saudi Arabian forces bombing of a water sanitation facility in Hodeida, Yemen. In the weeks that have follow there has been a 170% increase in cholera cases in the area. This follows the worst cholera outbreak on record, which has already seen one million people being infected. This is one of many atrocities that have been inflicted in a three and a half year long war, which has killed thousands of people and created the worst humanitarian crisis in the world. UK fighter jets, bombs and missiles have played a central role in the destruction, with almost £5 billion worth of weapons having been licensed in the first three years of the war. The current Labour leadership has taken a very strong line against government complicity in the military operations. In the last election the Party pledged to end these arms sales. This year’s conference saw Labour reaffirming its opposition, with Emily Thornberry and Jeremy Corbyn both used their speeches to condemn the terrible bombardment that Saudi-led forces have inflicted on Yemen. Such a change would be long overdue, and could reverse 40 years of UK foreign policy. But how would it work in practice? With the possibility that Brexit negotiations may bring down the government in the months ahead, how would a future Labour government approach the arms trade? Here are three policies that should be at the heart of a future arms export policy. Every year the government publishes its list of ‘human rights priority countries.’ These are countries that the Foreign and Commonwealth Office believe have particular problems relating to human rights and democracy. Every year the government licences hundreds of millions of pounds worth of arms, including to many of these countries. Last year the UK licensed £1.5 billion worth of arms to countries on the list: including armoured vehicles, bombs, fighter jets and tear gas. In total, arms were licensed to 18 out of the 30 countries: including Bahrain, Saudi Arabia, China, Egypt, Bangladesh and Israel. These arms sales could be used to fuel war, repression and instability for years to come. A future Labour government with human rights at the heart of its foreign policy should always start from a presumption of denial before issuing any arms licences to countries on this list. There is no doubt where public opinion is on the matter, with all of the polls showing that the vast majority of the public is firmly opposed to these arms sales. None of these arms sales happen by themselves. They are done with the support of government. It isn’t just allowing these sales, it is actively promoting them. The Department of International Trade’s Defence & Security Organisation (DSO) is a 100 strong civil service department that exists for the sole purpose of pushing and maximising arms sales. It identifies priority markets and plays a key role in organising arms fairs and industry events. It coordinates government supports and works closely with companies when they are pitching arms sales around the world. The issue has always been more institutional than party political. It’s not only Tory governments that have put these resources into promoting arms sales. Tony Blair’s government was just as pro-arms industry as Thatcher’s was. However, a future Labour government would have power could end this support. When considered nationally the arms industry is not a major employer, but in some parts of the country it is a key one. Across the UK arms exports only account for 0.2% of jobs, but in areas like Warton or Glenrothes arms companies are large employers. The people that work for arms companies are very skilled and the next government needs to work to ensure that their skills are used in positive and productive industries. One area that could be a central focus for a transition away from arms is green technology, which uses similar skills. But this isn’t possible without switching support from the arms industry. At its September 2017 Congress, the TUC passed a motion calling for a shadow Defence Diversification Agency to be set up. Such an Agency would work with plant representatives, trades unions and local authorities, so that practical plans can be drawn up for arms conversion while protecting skilled employment and pay levels. 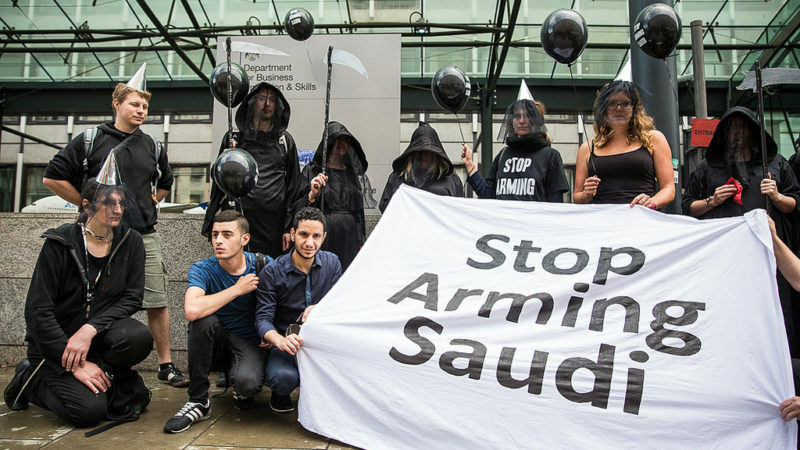 There is a consensus among progressive parties about the need to limit arms to Saudi Arabia – and a future Labour government would have the chance to fundamentally alter the way that the UK acts and is perceived on the world stage. A big part of that challenge will be to take on the influence and power of arms companies and end the moral hypocrisy of UK arms sales to dictatorships and human rights abusers across the world. Andrew Smith is a spokesperson for Campaign Against Arms Trade. He is also a member of the Labour Party in Lambeth, London.